“Sparkle and Fade”, I have never read a chapter title that was so prophetic of the chapter itself and in this case the last half to two thirds of the book. Tina Reber’s Love Unscripted started out beautifully reminiscent of an adorable film from 1999 that I am sure many of you have seen called Notting Hill starring Hugh Grant and Julia Roberts. Only in this case the superstar is the hero and the lowly bookseller, the heroine. Ms Reber sets the stage beautifully Taryn Mitchell has sworn off of men and in fact has never even seen Seaside, the sequel to which is being filmed in their Rhode Island town. My reluctant eyes pooped open when I heard the frantic sounds of women screaming. My vision was blurred by the sun and it took my eyes a moment to adjust to the pandemonium headed straight for me. That’s when I caught sight of him – what appeared to be Ryan Christensen – running full speed down the sidewalk. His body was on a direct collision course with mine. The imagery is fantastic, the reader can easily imagine a maddened hoard of female fans clamoring for a piece of their, who I imagined to be a young Robert Redfordesque, idol. It is unsurprising that he ducks into Taryn’s pub narrowly escaping sure dismemberment by fan. Who wouldn’t fall in love with their rescuer? Taryn and Ryan then spend an idyllic afternoon in the solitude of her bar, drinking, playing pool and getting to know one another. I read another review that commented that the book was over long and considering the subject matter it is an astonishing 579 pages long. Don’t get me wrong I love long books it allows me to stay in the author’s world that much longer but this kind of story simply does not require that many pages without risking repetition and the establishment of plot devices of increasing complexity and in the case of Love Unscripted, absurdity. By the end of the story there were no fewer than four villains in the piece and really how many stalkers and or obsessed women/men can one celebrity have? That isn’t even taking into consideration the evil paparazzi twirling their mustaches while cooking up horrible lies to drive this couple apart. The hero and heroine had completely regressed to behaving like melodramatic teens and like one of the characters does I wished I could slap them and tell them to snap out of it too. I feel that Love Unscripted had great potential and that ultimately it was Ms Reber’s editors and publisher that failed the reader. After the first 200 pages it was as if the author did not know how to conclude the story or that she would be doing so prematurely without adding more conflict and then when in doubt add even more. By the time I finished the novel I swear I would have screamed if I read even one more time a variation of ” you’ve got to trust me” when it was glaringly apparent neither one of them trusted the other as far as they could throw them. Perhaps I should have instituted the 24 hour rule that they have in my children’s sports before enraged parents are allowed to contact the coaches to vent their spleen but I simply could not wait to record my thoughts. 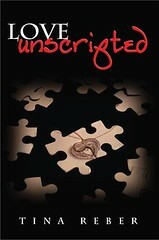 With stricter length guidelines and perhaps an editor who tried to bring this story back into somewhat plausible parameters Love Unscripted would be a solid 4 star read, instead of leaving this reviewer torn between a 3.5 star rating for the first half of the story and a .5 for the remainder because at least I finished it although I am quite put out that I ordered the sequel when still in the honeymoon phase of the first 170 pages even though some masochistic part of me wants to know what could possibly happen to these characters in a slightly trimmed down 448 page Love Unrehearsed.